We are excited to bring back one of our best sellers - ‘The Weekender’ which features illustrations from Sacha Strange. The perfect attire for those Friday and Saturday nights in the pub. Printed on White Gildan Long Sleeves with free Shipping Within Ireland. 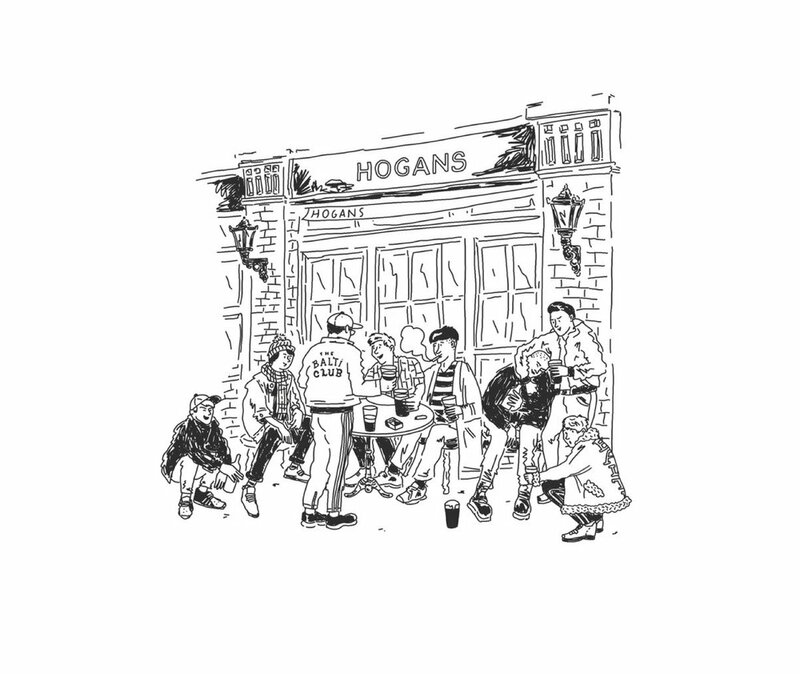 Early last week saw the release of Fontaines D.C. latest single entitled ‘Roy’s Tune’ from their upcoming LP, Dogrel. The release of the single was also accompanied by a beautifully shot Music Video written and directed by Liam Papadachi. The music video for ‘Roy’s Tune’ , which features award-winning actor Dafhyd Flynn, is a nod to Ireland - From a mindset of frustration, depression and a loss of innocence. Last week saw the latest instalment from C.P. Company’s ‘Eyes On The City’ series. With previous editions in Manchester, London, Tokyo and Seoul, we were delighted to find out that the latest documents The Balti Club’s hometown - Dublin City. Directed by Dublin born director Joshua Gordon, with creative and production from LAW Magazine, the episode features Irish rapper Rejjie Snow as he provides insight into the relationship and love he shares with his hometown. Since signing to Motherland at the end of 2018, Hugh Mulhern has been on a tear, releasing a poignant film for Webwise about the dangers of social media, then collaborating with Kojaque for Eviction Notice. Now he’s added yet another stellar music video to his collection with Fat Pablo’s ‘Shambala’. After a stellar 2018 featuring on Kojaque’s ever popular ‘Eviction Notice’ and releasing his own ‘Coca Cola Sky’, Soft Boy stand out Kean Kavanagh has just dropped a creamy rendition of Fragma & Coco’s 2000 dance hit ‘Toca’s Miracle’. After originally being released as an exclusive to Tidal, LCD Soundsystem’s music video for ‘Oh Baby’ finally got a showing on Youtube a few weeks ago. Directed by Star Wars’ own Rian johnson, and starring seasoned actors, Sissy Spacek, and David Strathairn, the six minute piece plays out more like a short film than a music video. In his latest film, which premiered over on Nowness, American filmmaker David Drake documents the comfort that a local football team provides to a small fishing community under threat. Written and Directed by Jon E Price, ‘Onlooker’ follows the story of man, machine and nature as they collide at a speedway in rural Suffolk. "I wanted to use the metamorphosis of the butterfly as a metaphor for change in the boy, like growing into your own skin," explains Price. "The film is partly inspired by classic British cinema, but also illustrated in an experimental way." Last year we created a short film about Shelbourne Park - Dublin’s last remaining Greyhound stadium. Located in the dockland area of Dublin City lies Shelbourne Park Greyhound Stadium. The stadium hosted its first race back in May 14th, 1927, making it a historic venue in the story of Irish greyhound racing. A few months ago we came across the work of Courtney Richards a.k.a Courtney Illustrate. Courtney’s distinct cartoonish style was both eye opening and unique, and it was only a matter of time before we reached out to the young Londoner and asked to work together. What followed was a collaboration on a new t-shirt design, and an in-depth interview with the artist. We can’t wait to share the new t-shirt’s with you, but in the mean time, have a read of the interview. Amsterdam based clothing company ‘Lack of Guidance’ has been founded on the idea of maintaining the principles of football and combining it with fashion and thought provoking design. By taking a different approach to football apparel, ‘Lack Of Guidance’ fill the void by creating accessible football influenced clothing. Shot over the course of two years, “16mmemories” came together out of accident more than anything else. Documenting a series of trips, moments and memories, 16mmemories acts as a visual time capsule. Yesterday Kojaque and Kean Kavanagh released the highly anticipated music video for ‘Eviction Notice’. Directed by Hugh Mulhern, the music video charts the highs and lows of a past relationship, and is pulled together by some incredible art direction from Clodagh Farrelly, and lovely visuals from Joshua C. Fry. Be sure to give this latest piece a watch. From filming skate videos on his dad’s Mini DV Camcorder when he was just fourteen, to directing a poignant commercial for Soar last year, Motherland’s Peter O’Brien, or P.O.B, is currently one of the most exciting emerging Irish directors. We got a chance to catch up with P.O.B and chat about his work, his inspirations and his future. Welcome to a new segment of The Balti Club, when we suggest some cultural activities in Dublin each week. This week, we highly recommend you get yourself down to the Irish Film Institute and catch a screening of Donal Foreman's visual essay 'The Image You Missed'. There are a handful of photographers that we come across every once in a while and are completely blown away by. You can't always put your finger on what it is, there's just a certain magic that bleeds through their work, a trait which is both familiar and completely original. It is creatives like this that we try to shine a spotlight on and share with our audience, and Jack Fleming is one such photographer. Formed over the last few years, the mysterious collective of Irish artists known as 'Subset' have continually attempted to alleviate the boundaries and sanctions unfairly placed on local artists by Dublin City County Council. Their latest endeavour has been 'Grey Area', an ongoing protest project which aims to demonstrate the colour and life that could be brought to Ireland's streets if the artists were given the ability and freedom that they need. Earlier this week we came across this beautiful film by Charlotte James and Will Dohrn. Narrated by her husband, The Colours of Iris tells the story of Iris Dee, an eccentric lady with a most unique sense of colour and style. Directed by Robin Mason, 'Swindon - A Portrait of Youth' is a snapshot of opinions about growing up in the UK. 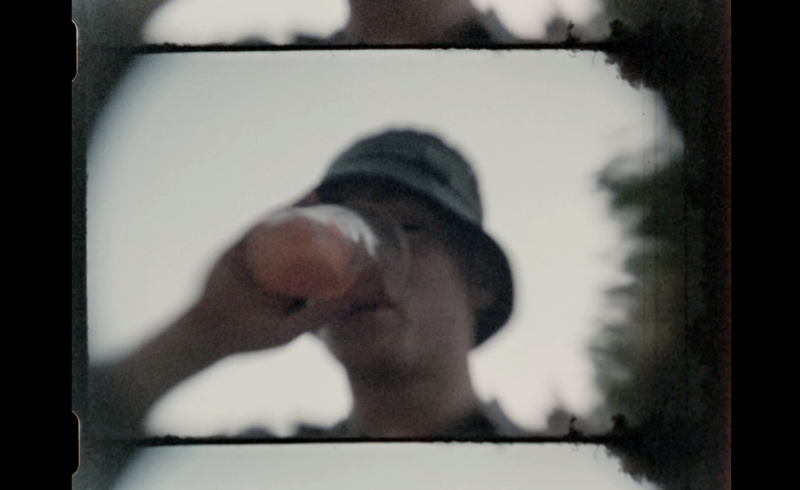 Shot on 35mm Kodak and Master Primes, the location of Swindon had been chosen due to it being the closest major town to where Robin had grown up, whilst also being an area that provides an appropriate representation for the youth in Britain today. Founded in 2015, London based CHEAT has quickly become the go to colour and finishing house for a long list of respected filmmakers. For those of you who may not know the intricate processes of filmmaking, they would go roughly like this: First the film is planned, talent gathered, scripts written, etc. then it is shot, big cameras, lots of lights, and so on, after that it would go to post production, where is it edited and pieced together like a big jigsaw, and then, finally, before unveiling itself to the world, it will be colour graded, and this is where some real magic happens. In the colour grade the image is brought to life, it's where skin tones come alive, and sun flares pop and stylistic nuances occur, and it is here that CHEAT would come in. 'Pride of Bukom' is the story of fisherman and boxer Nill Armarh Tetteh and his quest to become Ghana's pugilistic pride. Directed by the extremely talented Alexis Rossi, the scene is set in Bukom, a fishing town where Nill lives and works and a place forged by the culture of boxing. As his latest project, Dublin born filmmaker and photographer Joshua Gordon, offers up an intimate 23 minute insight into the lives of a select few members of a biker gang in Bangkok. The short documentary, which has been in production for over 2 years, shifts effortlessly between haunting and exhilarating, from the chilling CCTV footage of a brutal attack, to a carefree night of Karaoke. 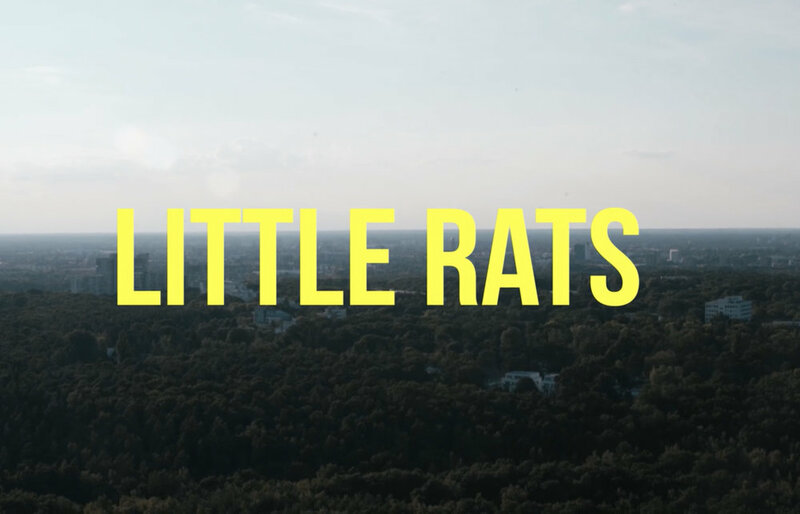 Directed by Jesse Heath & Theodor Guelat, LITTLE RATS is a short film that follows a South American graffiti writer, during his time traveling in Europe. The film comes in at just under five minutes, with clips from Berlin and Milan aswell as additional footage from Argentina, Germany and Copenhagen. Patta and Umbro have teamed up to release yet another collection of football jerseys, which pays homage to Amsterdam's most celebrated team, Ajax. The collection saw Umbro and Patta enlisting iconic Ajax goalkeeper, Stanley Menzo, for the lookbook, with the designs for the jerseys being inspired by the early 90's seasons at the club. Krahang is an experimental, fragmented documentary from Dublin born Photographer and Director Joshua Gordon. Made up of a hardback book and film, Krahang documents the unexplored subculture of a Thai motorcycle gang in central Bangkok. Each book is hand signed and numbered with 68 pages of both color and black & white photography. Earlier this week we saw the return of Copa90's beloved series Derby Days. To kick off the first in the series, the guys head to Spain to discover the ins and outs of the unique rivalries between clubs throughout this unique football nation. The first episode documents Galicia in the North West of the country. We came across the music of Bobby Basil a number of years ago when we were introduced to his track G Train. After a quiet 2017, Bobby has hit the new year hard, churning out fresh work. At the beginning of February he released WANNA, produced by Major Grove, and with accompanying visuals from the equally talented Hugh Mulhern, one of our favourite Irish filmmakers. Now he's treated us to some more new music with the release of 'Come Down To Me'. Next up in our series of conversations we have photographer Scott Charlesworth. Residing in the North West of England, Scott's work has massively inspired us here at The Balti Club. Having worked with some of the biggest players in the creative scene such as Crack Magazine and LAW, we were absolutely thrilled to catch up with Scott and find out more about his impressive body of work. It is with saddened hearts that we have learned of the passing of Paul Curran, a young Dubliner, poet, and artist. Gone too soon, the small body of work that Paul has left behind speaks volumes about his talent. Born and bred in Dublin, Craig Conlon, also known as Creed, is quickly becoming one of the most active individuals in underground Irish music. For people in the know, you may have heard of Creed a few years ago, when he was setting up secret underground raves in abandoned warehouses around his native city. Early last week, the guys over at Us released a beautifully put together short film entitled 'Cautionary Tales'. The short, written and directed by Us, tells the story of a strange incident that had happened to Aaron as a child, and has left him with an unusual facial disfigurement. Feeling unhappy and isolated, Aaron looks to seek understanding in the form of an unexpected support group. Earlier this week, Dublin based artist KOJAQUE released a video for 'Bubby's Cream', the first release from his upcoming project entitled 'DELI DAYDREAMS'. Produced by Jar Jar Jr, with Oisin Murtagh on saxophone, 'Bubby's Cream' has been on repeat for us all morning. Stoke City Team Up With Designer Adam Ward For 2017/18 Match Day Programmes. Stoke City have teamed up with talented Liverpool based Graphic Designer Adam Ward for their Premier League 2017/18 Match Day Magazine. Published in collaboration with Trinity Mirror Sport Media, this latest season edition of the Stoke City Match Day Programme has been designed using vector based illustrations. Friday night saw the surprise release of Drake's brand new EP, 'Scary Hours', a two track release from the Toronto native. The two tracks on the EP, namely, 'God's Plan' and 'Diplomatic Immunity' have generated a large amount of hype over the weekend with Six God fans across the world hoping and praying for more releases similar to 'Scary Hours' in the near future.